Appraisers are trained professionals. First, they derive a base for your home's value based on the recent sales prices of homes that are comparable to yours in terms of bedrooms, bathrooms, style, and square footage. Then, accounting for features and amenities that make your home different, the appraiser applies "adjustments" to that base value. This methodology is called the "Sales Comparison" approach and the result is your home's appraised value. It's the most common appraisal method used by lenders. As a homeowner in Charlotte , you can't affect the sales prices of your home's comparable properties, but you can help your appraiser understand how your home stands apart from these homes. This, in turn, can affect your home's adjustments, resulting in a higher appraised value. Be home for your appraisal so you can answer the appraiser's question, if there are any. Mention any new roofing, flooring, HVAC, plumbing, or windows you've installed since purchase. Don't mention projects or repairs you're "about to undertake". Appraisers don't credit for unfinished projects. Present a tidy home. This can contribute to a higher "overall condition" adjustment. Lastly, schedule the appraisal for a time that is convenient for your entire household. An appraiser needs to see, measure, and take photos of every room in your home. If a room's door is closed because of a resting child, for example, the appraiser may need to schedule a second appointment to complete the appraisal, and that can raise your appraisal costs. Congress has passed a bill which should increase the FHA loan limit back to $303,750 in the Charlotte market (no Lancaster County) through the end of 2013. Details will follow as the banks enact the new law - this is good news for buyers with some credit flaws. The higher monthly MI is still there. We read the following article in the Charlotte Observer this weekend and thought it was great. You can read the article in the observer here. So...How do you fight back when an appraiser - often from another city working for a low fee on behalf of a big bank - wrecks your sale, purchase or refinancing with a lowball valuation? Homebuilder John Nolde of Richmond, Va., recently sold a new, green-certified house for $199,500, only to see an out-of-area appraiser cut the value to $169,000, a figure below Nolde's own combined construction and land costs. Southern Methodist University business school professor William Maxwell had his four-bedroom Dallas home appraised at $790,000 for a refinancing last year, but when he went to sell it earlier this year, the appraisal came in at $730,000. Maxwell said the appraiser, who was not from the area, "had never walked into a single house in this neighborhood," and knew little about local pricing trends. He pulled his house off the market. Gary Crabtree, an appraiser in Bakersfield, Calif., sought to sell his mother's condo this summer for $155,000 - a price he says was supported by extensive documentation of recent comparable sales. Within two days he got a full-price offer, but an appraiser assigned by the bank valued the condo at $147,000. When his buyer switched to a second lender, Crabtree says the assigned appraiser "came from 126 miles away." Since Crabtree knew the appraiser was "geographically incompetent," he "spoon-fed" the second appraiser the original comparables. Voila! The valuation came in at the full $155,000 listed price and the sale closed in mid-October. Disagreements over real estate values are nothing new, but agents, builders and sellers say current market conditions - plus recent changes in federal rules that effectively encourage banks to use in-house or affiliated appraisal management companies - are magnifying the problem. Be proactive. Federal rules allow you to provide the appraiser your own comps - recently sold properties of a similar size, condition and amenity levels in your immediate market area. Your realty agent can help you pull them together before the appraiser arrives. Or for a fee of $200 to $300, you can hire an experienced local appraiser to assist you. Sara W. Stephens, president-elect of the Appraisal Institute, the largest group in the industry, says "if you know there are comparable sales in the neighborhood" where the price was affected by a divorce, financial distress or heavy seller concessions to the buyer, "make sure you call the appraiser's attention to" these factors. And give the appraiser a list of all the value-enhancing upgrades and improvements you've made, including dates and costs. Accompany the appraiser during his or her inspection of the house. Ask questions crucial to competency: Where are you based? How long have you been in the business? What type of certifications and professional designations do you hold? Are you a member of the local multiple listing service (MLS) - an essential treasure-trove of data for any accurate appraisal? Do you know local agents or brokers who can supply you with pending sales information and guide you on neighborhood price trends? If the appraiser doesn't have good answers, you are much more likely to end up with a poor appraisal. Alert the lender to your concerns as early as possible. After the appraisal is completed, ask for a copy to review - it's your right under federal law. If the value comes in low, check everything in the report, from selection of comps to the accuracy of property measurements. If you find serious mistakes and the appraiser refuses to make corrections, appeal directly to the lender. Most have procedures to follow regarding "reconsiderations of value." Ask for a second valuation by a locally competent appraiser. Finally, if the lender stonewalls you and the deal falls apart, consider filing a complaint with your state appraisal board. You can find contact information at Appraisal SubCommittee . The boards don't have the power to rewind your transaction, but they can discipline, fine, suspend or kick bad appraisers out of business. If you plan to buy of new construction in Carolinas sometime in 2012, don't expect today's low prices. Like everything in housing of late, the market for newly-built homes appears to be stabilizing and, in some markets, improving. As foreshadowed by this month's strong Homebuilder Confidence survey, the Census Bureau reports that the number of new homes sold rose to a 6-month high in October, climbing to 307,000 units on a seasonally-adjusted, annualized basis. A "new home" is a home that is considered new construction. It's the opposite of an "existing home". Home buyers are comparing new construction to home resales and liking what they see. At the current sales pace, the nation's complete new home inventory would now be depleted in just 6.3 months. This marks the lowest home supply since April 2010 -- the last month of the last year's federal homebuyer tax credit. By building only to meet new demand, builders are keeping home supplies in check, and home prices stable. They've also found a niche market 80% of homes sold last month sold for less than $300,000. Although the October New Home Sales report says that sales climbed 1.3 percent last month, the government's data was published with a ±19.7% margin of error. This means that the actual New Home Sales reading may have been as high as +21.0 percent, or as low as -18.4 percent. Because the range of values includes both positive and negative values, the Census Bureau assigned its October data "zero confidence". As home buyers, then, we can't take our market cues from the published data. Instead, we should look to other metrics including Housing Starts data and the aforementioned homebuilder confidence survey. 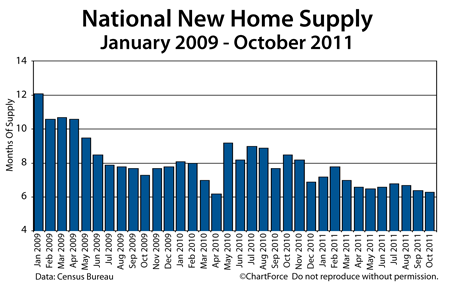 Each points to strength in the new home market, and foretells higher home prices in 2012. If you're in the market for new construction, consider writing an offer soon. Home prices remain low and mortgage rates do, too -- a combination that keeps home payments low. Next year, that may not be the case.